Nearly 500 high school biology students are participating in the Spring Biology Laboratory Workshops, being offered jointly by the Department of Molecular and Cellular Biology and the Howard Hughes Medical Institute. For three weeks beginning on March 11, students come to MCB in groups of 24, with their biology teachers, to experience science at work in the laboratory, guided by MCB’s Outreach Coordinators, Tara Bennett and Susan Johnson. Both former high school biology teachers, Tara and Susan assist Dr. Robert Lue, Director of the MCB Outreach Program, in formulating content for the program offerings. Students come for these spring workshops from schools in a three-state area–Massachusetts, Rhode Island, and New Hampshire. Biology teachers were invited to apply early in the year to bring their classes, and the MCB/HHMI Outreach Program draws from public, parochial, private, and charter schools, to ensure that a broad range of regional schools are served by the program. The Outreach Program particularly encourages participation by the schools around Harvard in the suburbs of Cambridge, Somerville, Belmont, Watertown, and beyond. The workshop content has been tailored to the individual level of each class, and the MCB Outreach team communicates with the invited teachers to be sure that the workshop content is appropriate for their students’ level of understanding of the processes involved. Jack Howard, manager of the teaching laboratories in the Science Center, assists with the creation of the workshop content in close collaboration with Tara Bennett and Susan Johnson. Students isolate DNA from their cheek cells and run PCR (Polymerase Chain Reactions) on their own samples, using a primary pair developed specifically for forensic testing. Students then analyze their samples by gel electrophoresis and learn to identify homozygous and heterozygous individuals. 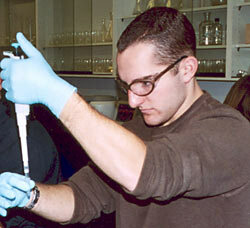 Students work with graduate students and postdocs from the MCB laboratory of Dr. Sam Kunes. By using heat cues, students “teach” fruitflies to choose between light, dark, and different-colored tunnels. Groups of students then compare the ability of wild-type versus mutant flies to navigate through the tunneled mazes. Students analyze their results using computer-based statistical analysis. Students study the structure of the mammalian heart by dissecting a fresh calf heart. Then they take blood pressure readings and correlate sounds produced by the heart with the mechanics of the heart. They also record an ECG in order to understand the correlation between the electrical signals and the cardiac cycle. Students learn about neuroscience by doing a variety of lab exercises including comparative brain dissections and MRI evaluations. They also learn about the structural and functional aspects of the nervous system, and investigate gender differences by completing recall and matching tasks. The new 3-D dissector computer program is an integral part of introducing them to the nervous system of humans during this lab.